As we expected there is indeed a Pokémon game coming to the Nintendo Switch, but it’s not quite what everyone anticipated. Rather than a Switch port for Pokémon Sun and Moon called Pokémon Stars, Pokken Tournament will be coming to Switch, with the title Pokken Tournament Deluxe. Though many hoped the Switch would see a ported mainline title, this does follow The Pokémon Company’s tradition of releasing side titles to Nintendo’s home consoles rather than mainline titles. The Pokemon Company has previously said that it believes Pokemon's main games are better suited to handheld consoles. Considering previous release patterns in combination with the news that there's going to be a new 2DS XL console later this year the news, while disappointing, isn't without precedent. 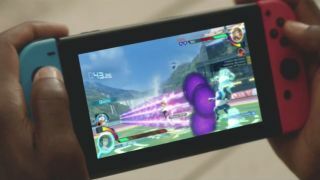 The versus element of Pokken Tournament will suit the Nintendo Switch due to the fact that it encourages social play anywhere and everywhere. To earn its Deluxe title, the game will feature 16 playable Pokémon that were on the Wii U version but will add five additional Pokémon, including Decidueye from the new Pokémon Sun and Moon games. The game will feature three versus three team battles as well as online ranked matches and friendly group matches so that you can play in a way that suits you. Pokken Tournament Deluxe will be released on September 22 and will feature heavily at Nintendo’s E3 booth this year. There was also an update announced to Pokémon Sun and Moon, but these mainline titles will remain on the Nintendo 3DS platform for now. Pokémon Ultra Sun and Ultra Moon were announced for release on November 17 and will offer an alternate story with new Pokémon and new features set in the same Alolan setting as Sun and Moon. Finally, for a bit of a throwback, The Pokémon Company also announced that Pokémon Gold and Silver are coming to the Virtual Console for 3DS like Red, Blue and Yellow did for the series’ 20th anniversary celebrations. These games were originally released in 1999 on GameBoy Color but players will be able to enjoy them on the larger 3DS screen. They’ll both launch on September 22 alongside Pokken Tournament Deluxe.